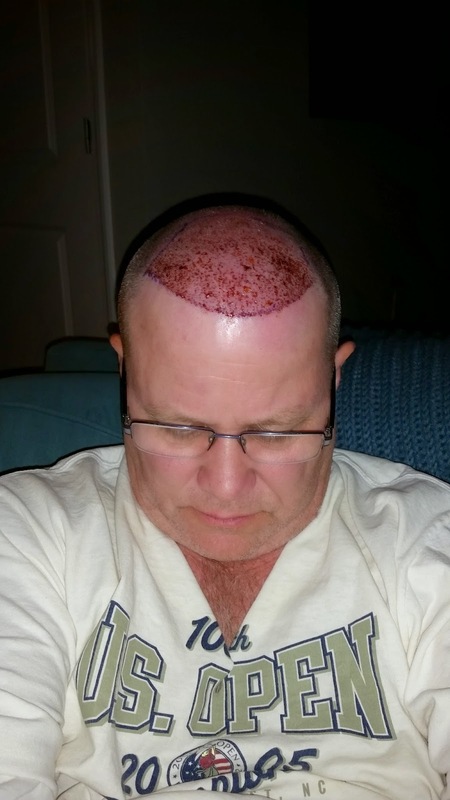 As most of you know who follow my blog on a regular basis..., I had 5,125 grafts transplanted back in September of 2012 (see archives on this blog site). This past weekend I flew from Louisville KY to Charlotte N.C. to visit with Dr. Vories. We decided to do some "touch-up" work to my hairline and to concentrate on a couple areas in the front. After preparing and shaving my head, Dr. Vories commented on my donor area. Remember, we extracted over 5,000 grafts two years ago! He said there was virtually no sign of surgery from the past!! He was astounded at how well my donor area recovered. As a result he felt very comfortable removing 2,000 more grafts and moving them toward the front. Here's a "selfie" that I took the evening after surgery. Check back each day. I'll begin posting lots of photos! Update from my 2nd FUE Hair Transplant!